Guy 1: What have you been up to? Guy 2: Looking and lots and lots of pictures of gunshot wounds. Guy 2: I’m studying. Pre-med. Guy 1: Ah. Going to be a doctor, eh? Guy 2: No, I meant premeditated murder. Two candidates abandoned their bids for the White House, today. Some say that he ran a poor campaign, but I think the whole thing was a painstakingly orchestrated business move. 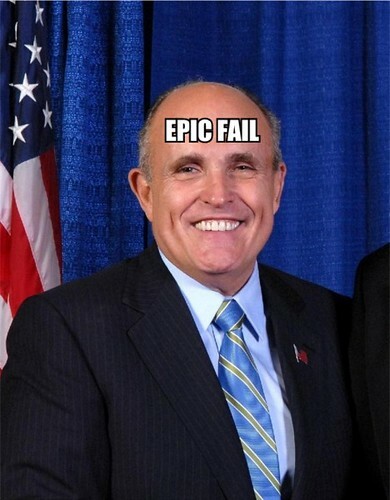 Having learned, in wake of September 11th, that he could make astronomical speaking fees for being associated with disaster, he figured another debacle on his resume could only help. 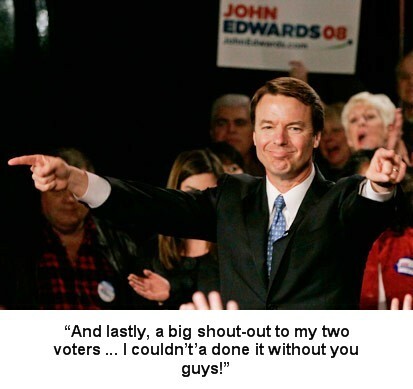 Edwards said the decision to withdraw was a tough one, but he wanted to devote more time to his 2012 presidential campaign. The 2008 Create Your Own Oscar Pool Page is live. Sometime people who read my site ask for advice. I guess that’s redundant–obviously anyone who asks me for advice would have to be a reader, as anyone who has met me in real life would know better. The conservative argument against taxes, in a nutshell, is this: it is fairer and more efficient if people are allowed to keep their own money to spend on those things they know they need, rather than to require them to hand it over to a Government to spend on what it thinks the citizenry needs. Given what you've told me, i would encourage you to vote for Obama for essentially the same reason. Of the remaining Democratic candidates, Edwards is, in my opinion, the most suited for the presidency. But if the last few weeks have shown us anything, it's (a) Edwards is not going to win, and (b) he's not going to drop out going to drop out on Wednesday, January 30th, you heard it here first. So why is remaining in the race at all. Many (including myself) think it's to become a kingmaker, of sorts; if neither Clinton or Obama collect enough delegates to win the nomination (a majority), Edwards could offer his accumulated delegates to one of them in exchange for something he wants: the vice-presidency, the inclusion of one of his signature issues into their platform, or the like. Now, if you really like Edwards or the issues he fights for, then voting for him still makes sense, as it might result in his going to the White House as Veep, or having his signature issues adopted by whomever becomes the eventual nominee. But if your goal is simply to ensure that Hillary doesn't get the nod, then it's obvious to me that you should vote for Obama. After all, any votes (and, by extension, delegates) that go to Edwards could wind up in Hillary's ledger eventually, if Edwards brokers a deal with her at some point, drops out and endorses her, etc. I'm glossing over a lot, here (like the fact that Edwards can't simply "give" his delegates to someone else), but the gist of it is this: you can "spend" your vote on Obama, or you can give it to Edwards and run the risk that he might "spend" it on a candidate you don't really want. At least I was conscientious enough to send my advice today, after South Carolina primary, to make it unactionable. By the way, I’m completely sympathetic to the idea that people ought to be able to vote for whomever they choose, even for someone (like Edwards) who seemingly doesn’t have a hope of winning. I agree! People ought to be able to do that! But the point is largely academic until this nation implements instant runoff voting, something I would love to see in my lifetime. I’m only and hour into the 100 minute King Kong, but I’m so bored that I figured I may as well start typing. According to the AFI, this film is one of cinema’s “greatest,” but, to paraphrase Inigo Montoya, I do not think that word means what they think it means. I’m guessing that, in this case, the ol’ double-k got the nod for being one of the most influential films of all time, but lord knows that ‘s not the same as greatness. Needless to say the special effects are outmoded, but I don’t hold that against the film. After all, the quality of a movie shouldn’t be judged by the caliber of its effects–which is exactly the point: strip them away from King Kong and you’re not left with much. The acting ranges from workaday to wretched, and while the plot is moderately interesting, the middle third, which serves only to showcase the Amazing Stopmotion Animation!! !, is interminable if you don’t find the f/x breathtaking. I will give the film props for lethality, though: I assumed that all death in this film would take place off camera, if at all, but, no, kong fucks up half a battalion of folks with extreme prejudice. The subtext of the film–that the real monsters are the humans, while Kong just wants to live in peace–is intriguing; too bad the filmmaker doesn’t do much with it. 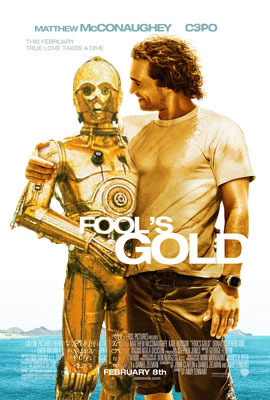 Maybe Peter Jackson utilizes the material better in his 2005 remake. 5/10. Yeah, chickened out of watching Sophie’s Choice this week. I will try to work up the nerve to do so next. Yes, I’ll set it up the Do-it-yourself Oscar Pool Page again this year. It will be online Friday. Ha! Who am I kidding? It will likely be online Monday. It was Ye Olde Tymey Romantick Comedy night in the Baldwin household this evening. The next film in the AFI 100 Project will be … oh, god. Sophie’s Choice. If I’m going to break this resolution, I guess now’s the time to do it. The Queen: I know, isn’t it great? The Queen: Okay, but there was little boy about Squiggles age playing with the puzzles. And when Squiggle tried to play with him, and the boy said “No, go away” and Squiggle cried.